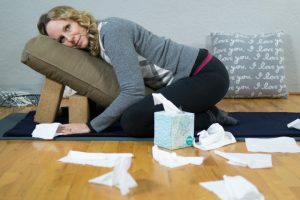 This restorative yoga class for when you have a common cold modifies all the restorative yoga postures to account for congestion in the nasal passages and in the chest. Keeping the head above the heart alleviates pressure in the head. Backbends open up the chest and encourages the flow of lymph through the lymph nodes in the armpits. There are also hip openers to encourage the flow of lymph through the groin to boost your immune system. This class is bolstered by the poetry of John O’Donohue to add gentle support when you are not feeling well. This yoga video is designed to increase your immunity against colds, flu and illness in general. Dr. Melissa West will teach you how to stimulate the organs and glands of the immune system including the thymus, spleen, lymphatic system and digestive system. You will also strengthen the electromagnetic energy field that surrounds you giving you an extra layer of protection from the outside influence and disease. Through this video you will develop your powers of resistance. By bathing your cells in healing energy you will finish this video radiating good health. Previous post: Is All Yoga Good for Anxiety? Which Style is Best?